The Mount Vernon Farmer’s Market had its final day this weekend, so we made sure to go stock up. Squash, carrots, potatoes, mushrooms, beets, peppers, a pumpkin for the porch and a big bunch of dahlias – we did pretty well. 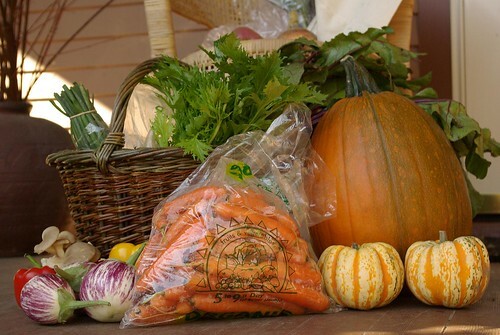 There will still be a few farmstands open, of course, but it’s never as easy as the market for getting all our shopping done with one fell swoop. Ah, well. Before leaving on our market trip, wondering what we might end up having for dinner, I was paging through The Babbo Cookbook by Mario Batali, and found an enticing picture of lamb rib chops dancing around a pile of something green. It was, apparently, a pesto made of broccoli rabe. What a good idea, I thought, I’ll get some at the farmer’s market and try it out! 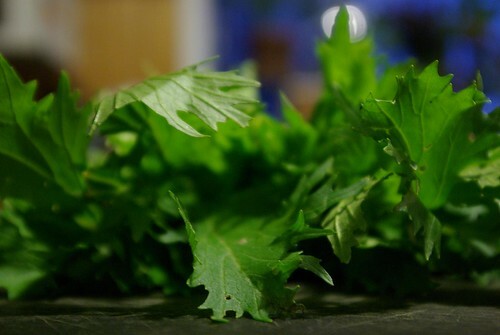 Naturally, not a single booth was offering it…but Blue Heron Farm did have lovely fresh bunches of mizuna, or Japanese mustard greens. Thinking one bitter green might well replace another, we bought a bunch and proceeded to wing the recipe. While Jon grilled the lamb chops, which I had rubbed with Mario’s recommended blend of lemon zest, fresh mint, salt and pepper, I blanched the mustard greens in boiling water, rinsed them and squeezed them dry. I plopped them in the little food processor with a couple of anchovy filets, a spoonful of capers, two cloves of garlic, a small container of chicken stock (maybe a 1/4 cup?) 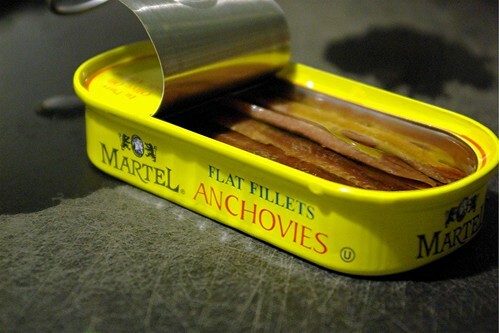 and some olive oil. It all whizzed together into something more like a soup than a pesto – maybe I didn’t add enough oil? – but which promised to be extremely tasty. 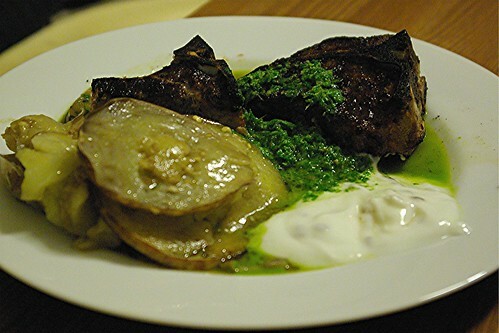 To serve, we had lamb chops and a baked eggplant tian on the plates, then spooned the green sauce around, plus dollops of yogurt mixed with freshly toasted cumin seed. I was astonished – this was really good! The sauce was a touch bitter and spicy, but with the added richness and pungent flavors of the stock, capers and anchovies. It mixed with the yogurt to create an entirely new flavor that made us wish desperately for bread to mop it all up. 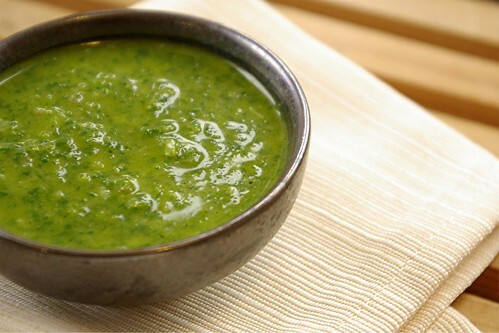 I really think this green sauce has possibilities. You could use it to flavor soup, or as a soup in itself. You could make it more pesto-like with the addition of herbs or more olive oil. It could be turned into a salad dressing! 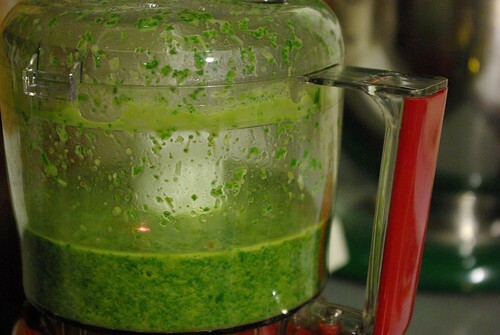 It’s a very painless way to eat your greens, and I intend to experiment further. Oh, you’ve given me ideas. I keep bypassing the mizuna because I just can’t quite figure out what to do with it. But now… well, the wheels are turning, lady. Thank you! Jennifer, you’re very welcome! I look forward to seeing what you do with it!